Gusseted Organza Bags, White, 5" x 8"
Dimensions: 5-1/2" x 8" + 2.75"
Gusseted Organza Bags, Silver, 5" x 8"
Gusseted Organza Bags, White, 4" x 6"
Dimensions: 4-1/2" x 6" + 2.5"
Gusseted Organza Bags, Copper, 5" x 8"
Gusseted Organza Bags, Gold, 8" x 10"
Dimensions: 8" x 10" + 4"
Gusseted Organza Bags, Light Pink, 5" x 8"
Gusseted Organza Bags, Purple, 4" x 6"
Gusseted Organza Bags, Lavender, 4" x 6"
Gusseted Organza Bags, Copper, 4" x 6"
Gusseted Organza Bags, Gold, 4" x 6"
Gusseted Organza Bags, Black, 4" x 6"
Gusseted Organza Bags, Navy, 5" x 8"
Gusseted Organza Bags, Red, 4" x 6"
Gusseted Organza Bags, Silver, 4" x 6"
Gusseted Organza Bags, Ivory, 5" x 8"
Gusseted Organza Bags, Olive, 5" x 8"
Gusseted Organza Bags, Light Pink, 4" x 6"
Gusseted Organza Bags, Hunter Green, 4" x 6"
Gusseted Organza Bags, Lavender, 5" x 8"
Gusseted Organza Bags, Red, 8" x 10"
Gusseted Organza Bags, White, 8" x 10"
Gusseted Organza Bags, Light Blue, 4" x 6"
Gusseted Organza Bags, Smoke Blue, 4" x 6"
Gusseted Organza Bags, Ultra Violet, 4" x 6"
Gusseted Organza Bags, Navy, 4" x 6"
Gusseted Organza Bags, Baby Maize, 4" x 6"
Gusseted Organza Bags, Ivory, 4" x 6"
Gusseted Organza Bags, Olive, 4" x 6"
Gusseted Organza Bags, Burgundy, 4" x 6"
Gusseted Organza Bags, White, 6" x 9"
Dimensions: 6" x 9-1/2" + 3"
Use American Retail Supply Gusseted Organza bags for the finishing touch on jewelry, candies, mini soap and more! Ideal for gift shops, jewelry stores and beauty salons. 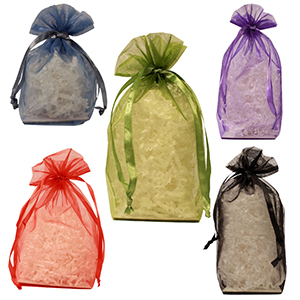 Also use Organza bags at a wedding, fill this with small treats for your guests. These gusseted organza bags have a satin drawstring. They are available in 4 sizes and 18 colors. All dimensions are approximations and given as the width of the bag when flat by total height in inches. If you don’t see the exact Organza Bags you need, call us at American Retail Supply 1-800-426-5708 to speak with one of our product experts.